A meeting of the Development Permit Board and Advisory Panel at 3 p.m. on Monday, February 4 will consider the development permit application for 1394 Robson, the now empty site of the former Robsonstrasse Hotel. The application is to develop a five-story commercial (retail and office) building with restaurant and retail uses on the ground and third level, all over one level of underground parking to be accessed via a car elevator. To register to speak at this meeting you can call 604.873.7770 or email kathy.ceremeno@vancouver.ca. For further details, see The Talk of the Town in this issue of The West End Journal, here. Photo from a previous year’s Personal Project Fair at King George Secondary. 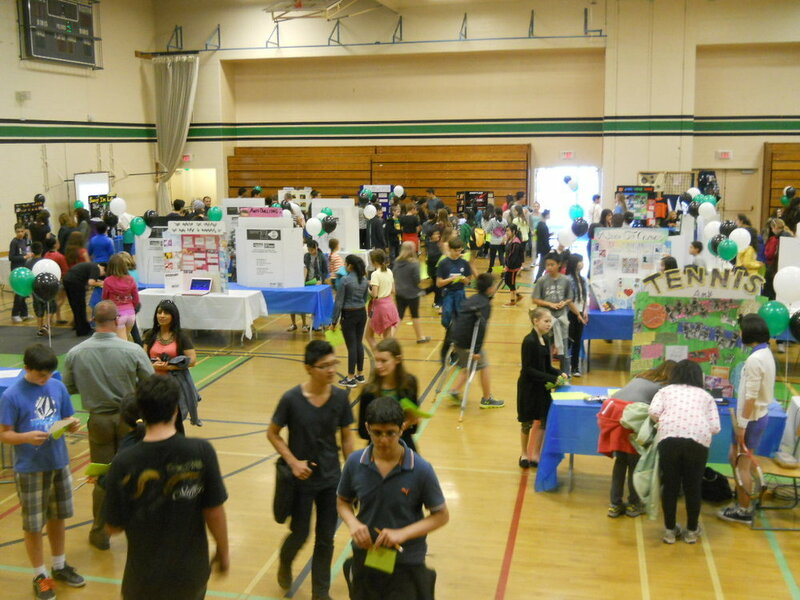 1 - 3 p.m. and 7 - 9 p.m.
King George Secondary holds its ninth annual free public event, the Middle Years Personal Project Fair and everyone is invited. This is an opportunity for teens at the school to display their yearly personal project and for the community to see and admire the students’ endeavours. Also open to the public during this event is the King George Secondary Archives, a treasure trove of old clippings, photos, and building models going back to the 1920s. Thinking the unthinkable, imagining the impossible, and discussing the improbable. That’s the theme of SFU’s Philosophers’ Café series of informal public discussions in the heart of our communities. Since 1998, this award-winning program has engaged the interests of scholars, seniors, students, philosophers, and non-philosophers through stimulating dialogue and the passionate exchange of ideas. The February Café at Joe Fortes will see SFU philosophy professor Alan Belk moderate a conversation about the advantages and/or disadvantages of having a large number of independent candidates running for office, as in Vancouver’s recent municipal election. Celebrate BC’s Family Day and join other families for gym playtime, fun lobby activities, and more. David Yates will be at the Labyrinth on February 22. The Labyrinth at St. Paul’s Anglican Church is a full 13-metre replica of the medieval labyrinth laid in the stone floor of the 13th-century Cathédrale de Notre-Dame de Chartres, 80Km south of Paris. It is laid on the hardwood upper floor of St Paul's Church Hall in a space once used as a theatre and a basketball court. The Labyrinth is open to the public Tuesday through Friday from 8:30 a.m. to 12 noon, Saturdays from 10 a.m. to 12 noon, and Sundays from 9:30 to 12:30 p.m. and from 7 to 9 p.m. The last Friday of every month the Labyrinth experience is accompanied by a local musician or group. Music on this last Friday, Feb. 22, will be by David Yates on didjeridoo and other wind instruments..
Click here to learn more about the St. Paul's Labyrinth. Join the West End Neighbourhood Food Network at a family-friendly monthly gathering. Bring something tasty, share some good food and conversation with neighbours, and pick up a West End Urban Garden Calendar. You’ll also learn about the many other West End Neighbourhood Food Network events and activities. Each month’s meeting includes a mini-workshop on a different food and/or gardening related topic, and is followed, from 2:30 to 3:30, by a meeting of the West End Urban Garden Club, where you can share information, help organize food and gardening workshops, and save and share seeds. 9:10 a.m. - 5:00 p.m.
Each month the West End Community Centre hosts a First Aid or other health care session provided in partnership with the Canadian Red Cross. The February course will provide an overview of First Aid and CPR techniques, taught in an interactive environment, for individuals who care for infants or children in the workplace or at home. This course is approved for Day Care and Day Home Providers in BC by BC Provincial Childcare Facilities Licensing. A three-year certification is given upon completion. Tales From the West End is an evening of story-telling where West Enders, past and present, explore and experience our community through stories about our past. Februray’s featured. Bring your stories and photos to share with your neighbours. February’s storytellers Isaac Vanderhorst and Janet Leduc will share the story of “West End Schools and Churches - 1890s to 1930s”. Discover the central role schools and churches played in early community life. Bring your stories and photos to share. Complimentary coffee and tea courtesy of JJ Bean.